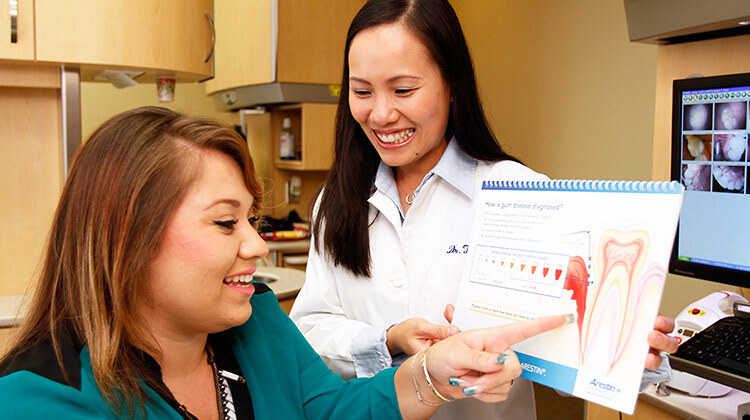 Our doctors provide friendly, comfortable care that puts the patient first. Our team of skilled doctors and specialists can take care of most of your dental needs under one roof. We offer comprehensive services, including general dentistry, cosmetic dentistry, dental implants, gum disease treatment and orthodontics. Our in-house dental experts are Dr. Sigafoos, a periodontist (an expert in treating gum disease), and Dr. Karpman, an endodontist (a root canal expert). They take care of our complex cases so patients can receive almost any treatment they could need right in our office. During your first visit, you’ll meet our friendly staff and the doctor will give you a tour of the office so you will feel comfortable and well-oriented. Through comprehensive diagnostics, including X-rays and an oral exam, the doctor will determine the health of your teeth, gums and jaw. The doctor will clearly explain any health issues and your treatment options and will draw up a treatment plan with you that suits your needs and budget. We have exceptional hygienists who have excellent technical skills and are also very attentive to your concerns and your comfort. When scheduling appointments, we allow the hygienist plenty of time to clean your teeth thoroughly and also educate you, with the help of teeth models and videos, on home care procedures, so that you can maintain your oral health between visits. Our doctors treat mild to severe gum disease using advanced technology for precise, comfortable treatment. Our minimally invasive procedures include gentle ultrasonic deep cleanings and non-surgical laser-assisted therapy. 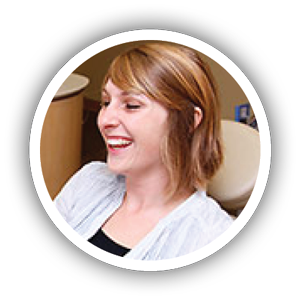 Dr. Sigafoos, our in-house periodontist, takes care of our advanced gum disease treatment. Our doctors can correct many smile imperfections, such as gaps, crooked teeth, tooth discoloring, chipped or misaligned teeth. Our cosmetic procedures include porcelain veneers, crowns, teeth whitening, gumline recontouring, dental bonding, dental implants, teen and adult orthodontics and Invisalign clear teeth straightening. Dental veneers are thin layers of porcelain that are attached to the front surfaces of your teeth to change their color, shape or size. They are a quick, long-lasting solution for smile imperfections such as chips, crooked teeth and discoloration. Our doctors have many years of experience in placing veneers. We offer several professional-strength teeth whitening options — Zoom and Opalescence in-office whitening and Opalescence home kits. Your doctor will recommend the whitening option that best fits your needs, lifestyle and budget. A crown is an artificial tooth cap used for restoring broken-down or decayed teeth. Our doctors create beautiful, natural-looking crowns made of high-quality, durable porcelain. 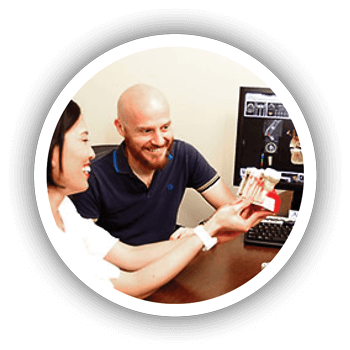 At our Poway office, we offer one-visit crowns using the CEREC® system. CEREC is an acronym for CERamic REConstruction. Using CAD/CAM (computer-aided design/manufacturing) technology, the doctor can create custom porcelain crowns right in our office while you wait, eliminating the need for temporaries. After just one visit, you’ll walk out with your new final crown! A dental bridge is a series of connected porcelain crowns used to replace one or more missing teeth. Our bridges are metal-free and we use zirconia for durability and a natural look. A full-mouth reconstruction restores health, functionality and aesthetics to a smile. Procedures might include gum disease treatment, dental implants, crowns, veneers, root canals, orthodontics or dentures. The doctors take a highly customized approach to full-mouth reconstructions. They will meet with you, complete thorough diagnostics to evaluate the condition of your mouth, and get to know your goals. They will explain all of your options and create a treatment plan that best suits your unique situation. A lifetime of good oral health begins at a young age. We treat children as young as two years of age. The doctors focus on creating positive experiences for our child patients to help them feel comfortable in the dental chair. We offer full dental services for children, including fluoride treatments, sealants, baby root canals, baby crowns and cleanings. 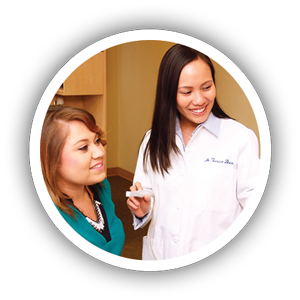 Dr. Justene Doan and Dr. Tran are highly trained and very experienced in orthodontics. They treat teens and adults. Our orthodontics options include Invisalign clear aligners and the cutting-edge edge Individual Patient (IP) Appliance® system. The IP system uses advanced, customizable brackets for faster and longer-lasting results. Invisalign is a modern, virtually invisible orthodontic treatment that uses a series of clear, plastic aligners to gradually straighten your smile. Our doctors have completed many Invisalign cases and have been awarded the designation “Invisalign Preferred Providers”. Root canal therapy is a procedure that preserves an infected tooth. In the vast majority of cases, it can be completed in one visit. Our doctors use the latest technology, including rotary instruments and a dental microscope, for precise, comfortable root canal treatment. Dr. Karpman, our in-house endodontist, handles our complex root canal cases. Our doctors create dentures that are aesthetic, natural-looking and comfortable. They use past pictures of you to duplicate your natural look as well as possible. We offer full and partial dentures, immediate dentures, acrylic dentures and durable, flexible Valplast® dentures. Our doctors also do relines and repairs, and they can stabilize your dentures with implants. Dental implants are titanium posts that act like tooth roots and are topped by restorations such as crowns and dentures. They are considered the modern solution for missing teeth. 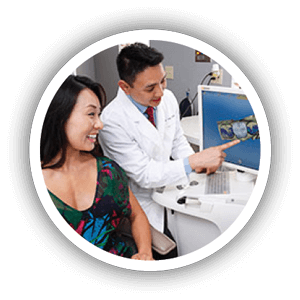 Dr. Justene and Dr. Tran are very experienced in implant dentistry and have both completed surgical externships and fellowships in dental implantology. Our doctors use advanced technology and equipment for precise planning and minimally invasive implant placement. Our doctors provide gentle tooth extractions, including extractions of non-impacted wisdom teeth. They use special tools for a precise, smooth extraction and a comfortable patient experience. We try to see patients with dental emergencies right away, on the same day if possible or within 24 hours. If you call our office after hours, our message machine will route your call to a doctor’s cell phone. Call 619-265-2467 for our San Diego office or 858-748-5100 for our Poway office. Treatment of TMJ (temporomandibular joint, or “jaw joint”) problems begins with a detailed initial exam and consultation to accurately evaluate the cause of the issues. Treatment options include a dental night guard and adjusting the bite by altering the chewing surfaces of the teeth. We offer metal-free tooth-colored fillings. They are considered healthier than amalgam (silver) fillings, which contain mercury. They also look more natural, as they blend in with the color of you natural teeth. Dental bonding can be used to fix minor cosmetic issues such as gaps between the teeth or chipped teeth. It is a more economical, faster alternative to veneers, although not as long-lasting. Bonding is a less invasive and more conservative option than veneers, as it doesn’t require the grinding down of teeth. We offer cosmetic gum recontouring for patients with a “gummy smile” or an uneven gum line. Our doctors use a precise, gentle soft tissue laser for minimally invasive, comfortable treatment. Our doctors are very experienced in bone grafting and sinus lifts. These procedures are used to make sure there is enough bone volume to successfully support dental implants.